[Update 2009/11/03: Clinton Street Brewing is no more.] The smallest commercial brewery in Oregon -- Clinton Street Brewing (warning: noisy website) -- stands just a few blocks away from new Portland heartthrob Hopworks. The brewery is an offshoot of the Clinton Street movie theater, a small art house cinema at the corner of SE 26th and Clinton. You can enjoy a Clinton Street brew while watching your movie, or have a pint in the tiny pub. There are 4 or 5 tables inside, seating about 15 people, plus a couple of outside tables and about 5 seats at the bar. No smoking inside. It had been a while since I'd been there, so I stopped in the other day to check it out. It turns out there is a new brewmaster at the Clinton, Dylan Goldsmith, and his beers are beginning to turn up around town branded as Captured By Porches -- which I'll call by the less-embarrassing acronym "CBP". 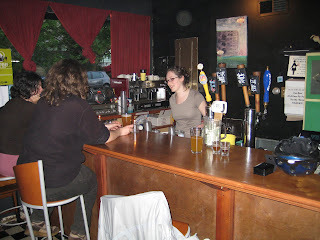 At the time of my visit, there were 3 CBP beers on tap: a Belgian Wit, an IPA, and an Amber. Now, none of these beers is going to become your new favorite, but sometimes you go out on a limb to experience something off the beaten path. The Wit was interesting, but quite a bit more bitter than I think it should have been. The IPA was a little funky. I think the best bet was the Amber, despite having a little bit of a homebrewy flavor (that's Dave's adjective). The theater owner, Seth, told me that it was quite a feat to brew enough for CBP's 30 accounts at Clinton Street's little two-barrel brewhouse. So Dylan is setting up a new brewery in industrial NW Portland. A decision will be made soon as to whether to continue to brew on Clinton Street or not. Moving the brewing equipment out might make sense for the theater/pub, since it would give them more kitchen space and allow for expanded food options -- currently the menu is anchored by pizza slices from Hammy's Pizza down the street. There is a concert this weekend to raise funds for the CBP brewery -- see this blurb on the Beer Northwest blog. I've also seen flyers for this on lampposts around 20th and Hawthorne. It's interesting that Beer Northwest talks about CBP as a St. John's brewpub. For one thing, I'm not sure if the NW St. Helens Road address they give qualifies as St. John's, being across the river and a mile or so south. And it would be surprising if there was really going to be a pub in such an armpit location. I suspect that Clinton Street will continue to be the tied house for CBP, with brewing -- but no pub -- out in NW. Or perhaps there's a missing piece of information here: a pub-worthy address that really is in St. John's. At Clinton Street, pints of CBP are $4, or they'll fill your half-gallon growler for $9. They have a few other taps also -- when I was there it was Ninkasi Believer (yes! ), Lompoc Strong Draft, and Bud Light. Meanwhile, keep an eye out for CBP around town. I had a near miss last weekend at Big Daddy's Barbecue on Hawthorne. The bizarre happy-hour posters at Big Daddy's included a subliminal CBP logo along with logos for Bud, Widmer, and Laughing Dog -- any relation to Laughing Cow? -- but they weren't actually serving any CBP. armpit locations = great rent prices. No matter what, I wish him luck. But a pub in that location sounds like a lot of work for not much potential. The low rent armpit location makes a lot of sense if he's just going to brew there. Great Post Bill. That first link has to be one of the worst websites I've seen lately, it seems to be trying to achieve that. Note the dancing "house" when you mouse over it. I recall some CBP beer on tap at sip n kranz a few months ago which were decent. More power to them getting a larger brewery, although from the perspective of a homebrewer with a 10Gallon setup a 2Barrel system (110gal) sounds big! Dave: Did you get electrolysis or something? Brett: Do you remember what flavor of CBP you had? I hadn't noticed the dancing house, I was too traumatized by the music and the non-scrolling scrollbars. Bryce: we had quite a lot to drink... and then some of the fellows there ... started handing ... cheese around ... and well just out of curiosity I tried a bit ... and well that was that. No, but I can tie a cherry stem in a knot with my left armpit...the right one is too pretty to attempt such foolishness. Web design by Powerpoint...not as awesome as my armpits.